Oh I would love to. Kai’s world takes SO much brain space. And why is the cat upside down? Hello! I have just started on KG book 2! I love this character! Any idea when you plan on releasing book 3? I want something to look forward to! 🙂 Also I saw a post about Kai’s age. I know he didn’t grow up like a normal child. From his behavior and some of his vulnerabilities as well as his risk taking nature, he seems about 23-25 human age. Is he the same age as Ryder by elfin standards or younger? Any way, very nice writing. Even the supportive characters are good. Please keep up the good work. Thank you for replying! The will work into my shed comment made me very happy! I have SOOOOO many questions! What is the meaning of the visceral attraction between Kai and Ryder? Does Kai have magic? Is he a shape changed dragon more then a dragon blooded elfin? Is he really sterile? ( I hope not!) of course I know you can’t answer any of these questions. But I had to ask anyway. 😊 And I really love the way you have developed his relationships in the story. He is so connected after starting life in such a traumatic way. That he can trust and love is amazing. I am thrilled with how he and Ryder are being portrayed. I like the growing respect and friendship. If they do ever get together and I honestly wouldn’t mind if they never got there on page, it will be real and significant: A confirmation of their relationship. I love that you have put world building, plot, and character development above having two guys hooking up. You have written a strong urban fantasy first. Looking forward to more! Heh. All of those questions I have the answers to. *grins* And I’ll share them over the course of the series. Promise. Am listening to the series for the third time and I would looove to hear what comes next! Thank you for writing such multifaceted characters and stories (I also love murder and mayhem). Well…there will be some fighting, some arguing and Kai will probably want to punch Ryder at some point 😀 Working thru the plot! Yeah…not sure? lol my Meggy Wafel would have had words for me if that was how I took the blasted picture. *sighs* the avatar thingy must be having fun with me?? ?or is just broken? Will go fiddle and see if I can get it right side up. Heh heh heh 😀 He does. This really is a good idea. More Kai sooner! Woohoo! I would also buy the sequel for this book. I read a lot so it this persona and world was rather refreshing. Kudos! Are there words written somewhere? In the near future? Pleeeaaasssseeeee. I keep checking for updates on a Kai sequel. I want to think about doing his series in novellas. Hi, just wanted to drop by and tell you I loved this book! Awesome world building and Kai is a great character! Can’t wait for more 🙂 Thank you!! Please keep them as full eBooks! Novellas are too short. I shall do my best 😀 It all depends on how much time I have 😀 But let’s hope! Squel, please! The character is fascinating, and he deserves love & a HEA! When will there be a new Cole. McGinnis book? Great !is there a Conner book combining in the Sinnerseris? I would like another Kai book, please! Heh. did you see the news? I really hope we’re allowed to ask book questions here. I was re-reading this and while there are tons of things I want to know, I’m curious. How old is Kai exactly? We know he didn’t grow up as a normal child or even elfin would, but he doesn’t seem to know how old he is. But Dempsey being human and still alive, Kai can’t be too old can he? I made him 30 in my head. And is his cat really a goblin? Or part goblin? These are completely random factoids that I’m stuck on. Thanks in advance. Sorry if I posted in the wrong area! Kai doesn’t know how old he is. BUT that will be revealed. His father had him for a long time and could manipulate flesh so his age is a bit iffy. Mentally he’s between 25 and 30. 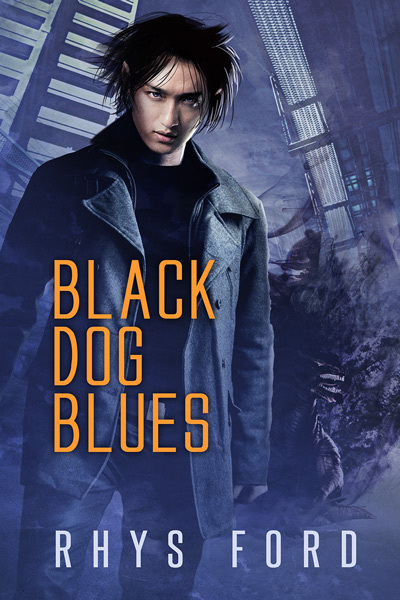 Black Dog Blues seems to have disappeared from Amazon and Smashwords. I can’t seem to find this book anywhere. It’s not even on the DS site. Where can I buy it from? I love this book! One of the best in the genre. I can’t wait for another! One of my favorites. So thrilled to hear you’ll be adding more. I was wondering. Have bought the first published black dog blues. Do I have to rebuy the new one. Did you make any big changes to the store? Loved the store and would hate to miss anything new in the store. Can’t wait for the sequel. Yes that makes sense. I can’t wait for the next book. Just finish reading Black Dog blues. Can’t wait for the next one. I’m not usually a fan of the Fae but your story just pulled me in. Awesome world building. I am personally begging you for a sequel….Just finished my third read and I am feening for more! I absolutely love Kai and Ryder together. Can we get a short? A prequel? Anything! I can tell you that things are in the works for a sequel and well, other things. *grins* ALSO! Greg Tremblay is working on the audiobook for Kai *cheers* So you will have that soon! Promise! Hi! And thank you! Greg Tremblay will be doing the audio book for Kai and he’s already started it. So it shouldn’t be too long. He did a great job in the snippet I heard. Soooo exciting 😀 I’ll post it on my blog when I know! Just started the audio book and am loving it!!! I just heard the audio for this book and it is great. I can’t wait to the next one. I will be looking for the paper book to have. I have the e-book & just finished listening to Greg doing Kai for the audio book…..please, please we NEED a sequel. Love Kai & Ryder. Want to learn more about Kai’s family & what they did to him. Kai 2 is in the queue. *grins* Promise. And thank you. I stopped by for Kai news…and here it is (kinda)! A favorite character, I’m looking forward to more! I realize that the cover pix is a combo of pix & painting, but who is that lovely creature who posed for Kai? Ah, it is a model from Stock photos. Anne Cain did the cover. He is, oh my, so delish. Anyway I can view him sans what makes him Kai? Oh, my, more than one yum-yum to make Kai?! Hey! Wondering if there evr could be like a crossover between Black Dog Blues and aink and Shadows. They kind of have the same universe. It would be so cool if they did! Oh, I know I will! So excited for the next book. Is there an expected release date, or possibly a name for the next book? I don’t have a name yet but it will be Mid 2016 😀 WOOOT! Cannot wait for more Kai & his friends. Is that date definite? I cant wait much longer!!!!!!!! Dropping in to find news about book two…mid 2016? *flops on ground* I’m just gonna lie hear till then . I just finished listening to this, and I’m always astounded by the good luck I’ve had with books on Audible. I’m so glad I found this book, and I’m very much looking forward to more of this series. It’s so well done. I usually only listen to books while I’m at work, but I ended up listening to it on the way home and then just laying about all evening to finish. This is such a fascinating world. Thank you so so much. The narrator, Greg Tremblay, is a God among men and such a sweetheart to work with. I really enjoyed his input and take on Black Dog Blues. I’m working on the second one so…. soooooon! Ahh! I just saw the preorder info for the next book, and I am so excited! Do you know if the audiobook will be released at the same time? I listen to BDB so much at work, and I can’t wait to have more about Kai’s world. Just like Niyx I typically listen at work and read at home, but this book could not be stopped. I cant wait to see more development with Kai and his neices. I staryed as a Sinners series fan and now Kai Gracen is taking the spotlight, or at least sharing. *crosses fingers* Thank you. I am so glad you liked it! I stumbled onto Kai and his merry band of misfits courtesy of Audible. I really enjoyed the audio book and the VO actor had a good command of the different personalities. I read through all of the comments hoping I could find info on the second one but I think maybe it hasn’t been released? Also – this isnt my normal genre, but I really liked the fact it wasnt written for teens. I chew through those fairly quickly, usually in a couple hours (eion colfer),and they’re more for my 12 year old son than myself so thank you for that. I make a habit of reading what he brings home and this was a pleasant surprise! I am going to go Amazon your other works but I am curious – the Merge – im so interested in it. It was mentioned so much in the story that I hope the history of it will be visited more in coming books. Thanks again for introducing me to Kai, he’s perfectly imperfect! Kai 2 will be out next year and Greg is said to be onboard for any audio. And no, it’s definitely not for teens. I write for two imprints of Dreamspinner Press, its main line with gay mystery & paranormal thrillers / romance and also for DSP Publications, an LGBTQ focused genre imprint…which Kai is a part of. Ah, the Merge. We’ll be getting into that soon. I’m looking forward to exploring the setup and I”m truly glad you found Black Dog Blues and liked it. I’m so excited about the new book. I’m really looking forward to book 2! Loved the first one. Just finished listening to this book and just LOVED it!!! I know how much it takes to write a book and get it all out into the world and I know some authors hate it when fans ask – when’s the next one, when’s the next one. So I won’t ask, I’ll just quietly sit here and wait patiently for it. I also just wanted to say that I also loved Murder and Mayhem as well. Squealed when I heard my name! I do hope there’s a sequel to this one, loved the banter between Rook and his grandfather. That’s about it – currently listening to Sloe Ride. Whoot! Great news for a sequel 🙂 Loved the audio as well! (Listened AFTER reading, I do LOVE my reading.) Looking forward to all your releases next year. Thank you for a wonderful mix of fantasy and grit. This world you’ve created is full of corners and shadows I’m excited to explore further. Thank you! I’m away on the second one right now! So any updates on the next kai gracen book, been waiting forever or maybe it just seems that way. Loved fish stick Fridays and the sinners gin series. Today. 😀 Sheesh. WordPress is not happy. Are Ryder and Kai ever going to be together?! I have read everything I can find by you. Can I please have more Kai, Dahlia and Newt now? Not sure how I missed BDB, I thought I bought all of your books … but anyway, glad I found it! This book … wow. I love your world building, your characters and the unpredictable plots. Love the dialogues and the interactions. This is by far my favorite book of yours. Read it, finished at a time I should have been sleeping, and went right back to the beginning to start over, since I couldn’t stand to be parted from Kai and his crew. Pretty please, if I can sacrifice my sleep to read your stories, could you sacrifice some to write the sequel a bit faster? JK. Is there a title yet, so I can pre-order on Amazon?? Well hot damn! And I just finished a couple other Greg Tremblay books – I like him (98%) so this should be great! I’ve been trying to restrict myself, but have lost count of the number of rereads of Kai’s books! So, definitely love what you’ve done with this story and this character. Kai is so unexpectedly thoughtful and sensitive, which is somewhat due to some of people around him but most of it comes from Kai himself. Any thoughts on how he turned out to be not like the rest of his family? Kai’s an interesting character to write. I really love playing in his world. I know it’s early to be so eager, but I can’t wait for the third installment. This is such a great series. Will we get a new Kai book this year (please)? But yes, I too, would rather have the next Kai book than anything else. I agree! Kai 3! Lol! Read “Mad Lizard Mambo” instead of sleeping the day after I got it. No regrets at all. Love, love, love those two, but I can’t wait to see whatever else you turn out this year, since I have spent all the money on (almost) all of your books. Kai is wonderful. Always. I love his sass and pretty much everything about him. Thank you sweetie 😀 xoxoxox Heh. I hope he likes them! Snorts. Kai is on the schedule. That’s all I can promise you. I have a few books before I hit his next one but he is there. I am pretty stacked in but I’m going to try to get to him as soon as I can. Just finished re-reading the Kai Gracen series and absolutely can’t get enough! Such a beautiful world, well fleshed out characters, and that snark? Can’t wait to see what you’ve got in store for this delightful band of misfits! Aw thank you! *grins* I love writing Kai. He’s such a delight to play around with. Truly. I am so so glad you liked him and his world! BTW, How did Kai get Gracen as a last name? Oh that’s something we’ll talk about later. Thou art a tease milady writer! And no clue as to when we will get Kai 3! Torture! I have to write it. It’s in the queue 😀 Promise. Just checking in on Kai Graven 3. Any idea of when next year it will come out? Also have you posted in more Kai snippets or shorts? You should consider a Patreon page. LOL! I would pay for more Kai why we waited and inside into him and his world. Kai is in my queue! Promise! Hopefully early next year. Hurray! Snippets until then maybe? I have no snippets. Sorry. Every book I find from you is always my favourite. But these. Oh man these are more than just favourites from you, they just might be my favourites – full stop. It’s been donkeys’ years since I’ve had a new urban fantasy book/series to enjoy and these are just the thing. And Kai. Yeah, I see a pattern here – first Miki, then Kismet, Rook and now Kai. He is just a special kitten in all sorts of ways, and I adore him so much. Just checking for a Kai release update…Next year is still such a looooong time away. I had to go to DPS(?) to get the first book. It wasn’t available in kindle format in Amazon. But so glad I did. The second was on sale so I still made out alright. It is hard to pay a lot for an unknown author. I am not a fan of bodice rippers and I could see that was a specialty. But this was just perfect, and thrilling. Your world building is spot on. You pull no punches when it comes to the story. If a person has to get eaten by a monster, then they do. It makes your books nail biting fun. I am now a fan and I am even eyeing the bodice rippers in your line up a bit. I look forward to more Kai. Hi and thank you for reaching out to me. I was quite alarmed to discover Black Dog Blues isn’t on Amazon as a Kindle because it should be. I have pinged the Publisher about it. Thank you for the information. I can say I’ve never before been slotted in the bodice ripper category *grins*. Ever. Probably because I write mostly mysteries, suspense and paranormal. And M/M at that so not a lot of bodices, mind you a nice bodice wouldn’t be amiss. There is a very dark contemporary in there though. I like playing the field. I hope you find something you enjoy. There is sexual content in most of my books, a few scenes although my DSP Publications ones do not contain any. Let me know if you find something you like. Well, Bodice rippers to me have adventure, mayhem and a lot of sexual content. There is usually a naked six-pack on the cover. I do not enjoy a lot of sexual content. Lived that, don’t need it now. Flirting is great, adds tension. But he rammed what pole into where is boring at best. My opinion only. Lots of folks love the stuff in print. You are an exceptional writer. Your Kai series adds plant of tension just by the world and characters. Hope to see more. 1. Yes. Kai 3 is on the queue. 2. No snippets or anything because I write in linear form. From A-Z so I don’t piece-meal books. 😀 So I don’t have anything leftover. Kai is a HELL of a lot of fun tow rite 😀 *hugs* I am so glad you liked him! I know Kai 3 is in the queue and there is no point asking for a release date, although I’d dearly love to know. 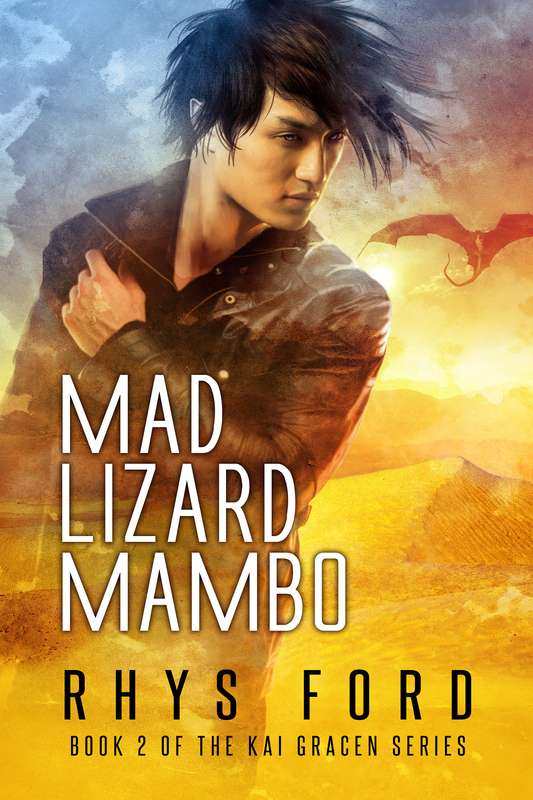 I’ve just read Mad Lizard Mambo (again, again) and I think Kai might actually be my favourite of your characters. It’s a close call with Sinjun and the other Sinner’s boys (and Deacon from Half Moon and Tristan from Hellsinger etc) but I just wanted to let you know I think he’s great and I’m really looking forward to the next book. I think your writing is awesome and I love your work. Thank you. If I wasn’t so sad rn I would of squealed when I just got your “Kai is on the Horizon ” email. So looking forward to reading the 3rd book. Rhys I have a question about the Merge. Is it planet wide or just California? Are stalkers an international group? Has Kai ever left the US? Also wanted to give you a writer Kudo. When I took creative writing at the university the professor was always on about show don’t tell. Your writing is such an example of that. Any reader could describe Kai’s Personality and character because you are so good at using his actions and his relationships to reveal him to us. Big kudos. You don’t tell us who Kai is. You show us. It is planet wide. I just am focusing on the West Coast because well, it’s easy to get around. Not per se but there are stalkers in some capacity world-wide. Yes, Kai has. He’s been to Canada and Mexico. Oh thank you so much for your kind words about writing. I adore writing Kai and he’s pretty easy to write for. He’s a fantastic character to play with and I enjoy writing his books. Any updates on the new Kai? Haven’t seen anything about it in the emails. Thank you!!! Can’t wait for it. im in love with the characters and the world you have built in these books! i have reread/listened to these books more times than i can count. i just stumbled across the dirty ring(tone)s and was wondering if you will ever consider doing one for this book series. But we will have a third book! Can’t wait … Pretty please hurry!?? Heh. No, Roku and Kai are different worlds but they’re both very action-focused. And a hell of a lot of fun to write! I’m really glad you like them! Just checking in on Kai 3! I seriously can’t wait. I am hoping that everything flows so well that we get a book the likes of Game of THRONES in length and depth! Lol. Write well! March 2019! It’s in edits! I dunno when or if that’s gonna happen 😀 But you know… *grins* Kai is grumpy. I actually love the tease. Lol! UST is the best!! And I like that Ryder hasmto earn it! Have just re-read the first two (again!) and have pre-ordered this one. I think Kai might be my favourite of all your boys – and that is really saying something, if you think about the competition…. Love your work, thank you! I’m so excited 3 is up for pre-order ( i’ve per ordered it) Kai is one of my favorite chara cters and i’m really excited theres a 3rd book coming! 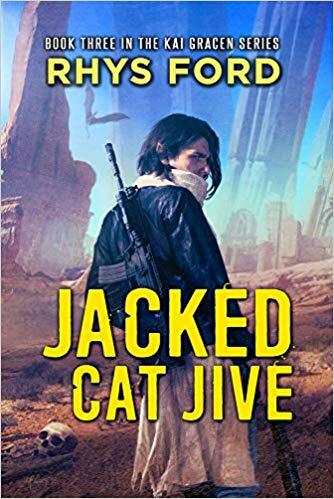 Will Greg Tremblay narrate the audio version of Jacked Cat Jive? If yes, will that be out soon? He really makes you characters come to life!